Biego, G. H. M.; Yao, K. D.; Ezoua, P. & Kouadio, L. P.
Canned foods are increasingly used in food packaging. Packaging serves mainly to preserve, inform and sell foodstuffs. In order to avoid migration issues of chemical compounds from tin cans to foods, covering internal surface of the tin cans with epoxyphenolic and organosol resins is widespread. However, monomers like Bisphenol A Diglycidyl Ether (BADGE), number among the constituents of these resins capable of migrating to foods. This chemical compound (BADGE) is highly toxic not only for the immune, reproductive and hepatic systems but also for biomolecules such as DNA, nucleic acids, proteins, and hormones. Simulation tests of migration can be used to assess the significance of BADGE migration. For this study, the migration and degradation tests were realized with metallic sheets and cans lacquered with epoxyphenolic or organosol resins. BADGE concentrations were determined by High Performance Liquid Chromatography (HPLC) using a Hewlett Packard HPLC chromatograph 1050 serial equipped with an injection valve of 50 μL, a Hewlett Packard spectrophotometric UV detector serial 1050 and a Hewlett Packard integrator serial 3396. BADGE detections were made at 275 nm and compounds were separated on a LiChrospher 100 RP-18 (Merck, 250 x 4 mm I.D., 5 μm) column protected by a guard LiChrospher 100 RP-18 (Merk, 5 μm) column. The mobile phase was a mixture of methanol, water, and dichloromethane (CH3OH-H2O-CH2Cl2) according to 50%-20%-30% proportion of solvents and the flow was 1 mL.min-1. The content in BADGE ranged from 3 to 37 μg.L-1. These concentrations were only slightly influenced by the storage conditions (duration and temperature). The highest concentrations were found in distilled water from cans analyzed just after sterilization and the lowest concentrations in distilled water from cans stored at least one day before analyses. BADGE degradation tests in aqueous environment provided an explanation to the lowest concentrations of BADGE in lacquered cans. Finally, the number of sterilization also proved to be critically important for the reduction of BADGE content in cans. 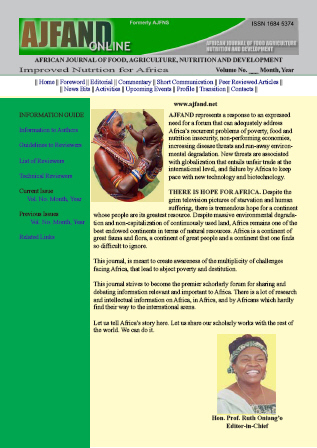 © Copyright 2010 - African Journal of Food Agriculture, Nutrition and Development.